NO UK temporary delivery stop anymore!!!! The Brexit, ? ?, 20? ?, is approaching rapidly. Within a few days, the UK will leave the EU. With or without Brexit deal and with or without agreements. Secret Caché the Netherlands/Belgium (www.COFFEEorTEA.eu / www.DutchDrop.eu / www.Easy-Food.eu) ships many products each day to the UK with a delivery time of ~2 days, without extra costs to professionals and consumers. By the ? ?, this will change drastically for UK clients, because the UK will leave the EU, UK customers will have many EXTRA costs. Until the ?? a member of the EU like the UK, will pay, for example, 8,95 Euro freight costs (<30 KG) and a low VAT rate. We also don’t charge any extra costs. UK Changes starting from the ?? 20?? - EXTRA import duties for orders greater than 135 English Pounds. o The new rate is still unknown. - EXTRA costs for import clearance, both in the UK and the EU. o The new costs are still unknown. 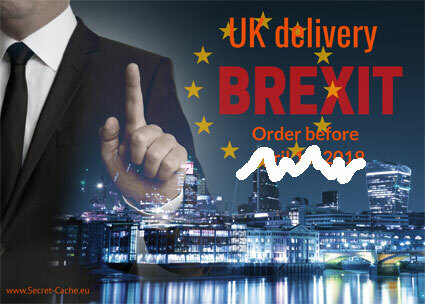 Whether there will be import/export agreements between the UK and the EU, Secret Caché will send all shipments as “DDP” (Delivered duty paid) shipment. This means, Secret Caché will pay the UK VAT and the UK import duties in advance, so there will not be any delays by the customs. The invoice after the ?? 20?? will be significantly higher than the current rates. Because there is a lot of uncertainty concerning the Brexit, we will stop shipping to the UK after the ?? 20? ?, until there is clarity regarding shipments to the UK. Make sure you order in time! Our advice is to order well ahead of the deadline (?? 20?? ), so we can handle your order with EU conditions and a low VAT rate. You will save a lot of money and unexpected delays if you order way ahead of the deadline! We will expect the prices of products that are originated from the UK to increase. We also expect a lot of delayed shipments to our warehouse. Since March 2019, we have added a lot of stock to our warehouse in Belgium, so we will have as little as possible delays, for our customers outside of the UK. The prices are not increased with extra import duties after the ?? 20??. We realize this is a bothersome period after the Brexit, we decided to attend you as a UK customer beforehand so you are aware of the consequences and are able to store enough stock in advance. For specific questions concerning the Brexit, please don’t hesitate to contact one of our customer support employees.